Description: Shell large, lightweight, protoconch about 20 mm diameter. Whorls rounded, smooth except for weak spiral grooves on top fifth of body whorl, and axial growth lines. Columella with four plaits, outer lip smooth, flared outwards. 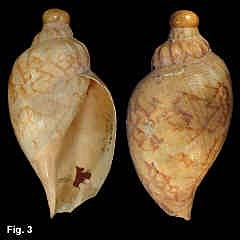 Background colour cream or yellowish-brown; columella and inner edge of outer lip orange; spire whorls unpatterned, body whorl with two wide spiral bands of irregular axial zigzag brown lines. Size: Adults 200-303 mm in length. Distribution: Endemic to Australia; Sandy Cape (Fraser Island), Queensland, to eastern SA and all of Tasmania. Habitat: Subtidal, 73-457 metres Moderately common. Remarks: The colour pattern of brown banding is quite variable, almost unbanded specimens being not uncommon. An albino form (Fig. 2), with or without the external brown banding but with white interior, is sometimes taken in southern NSW, and has been called Livonia mammilla leucostoma Mayblom, 1951. 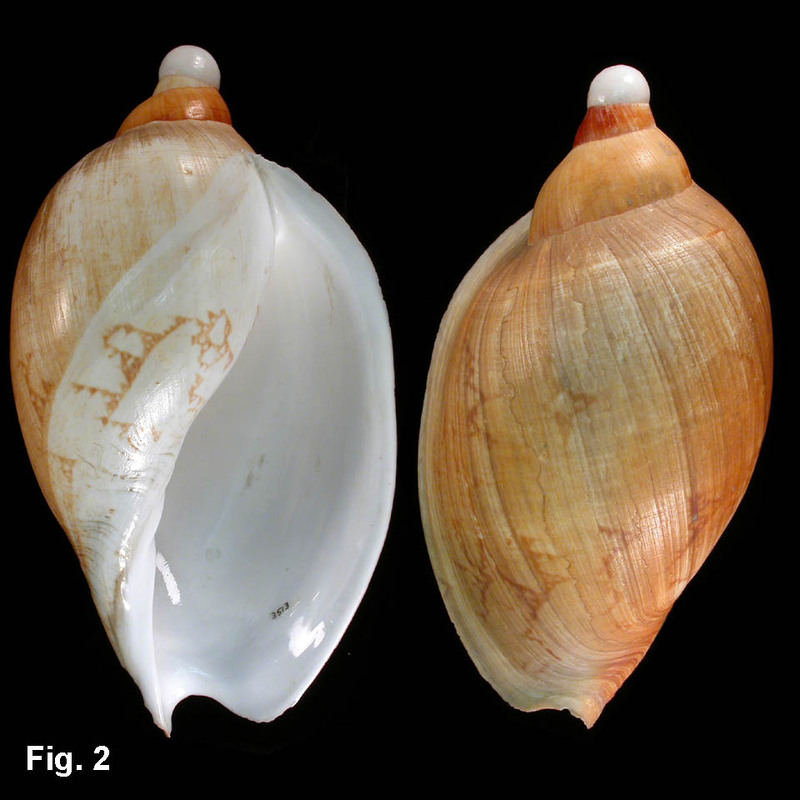 The shell described as Livonia quisqualis Iredale, 1957 (Fig. 3, the holotype) appears to be a hybrid between L. mammilla and L. roadnightae (Willan, pers. com.). 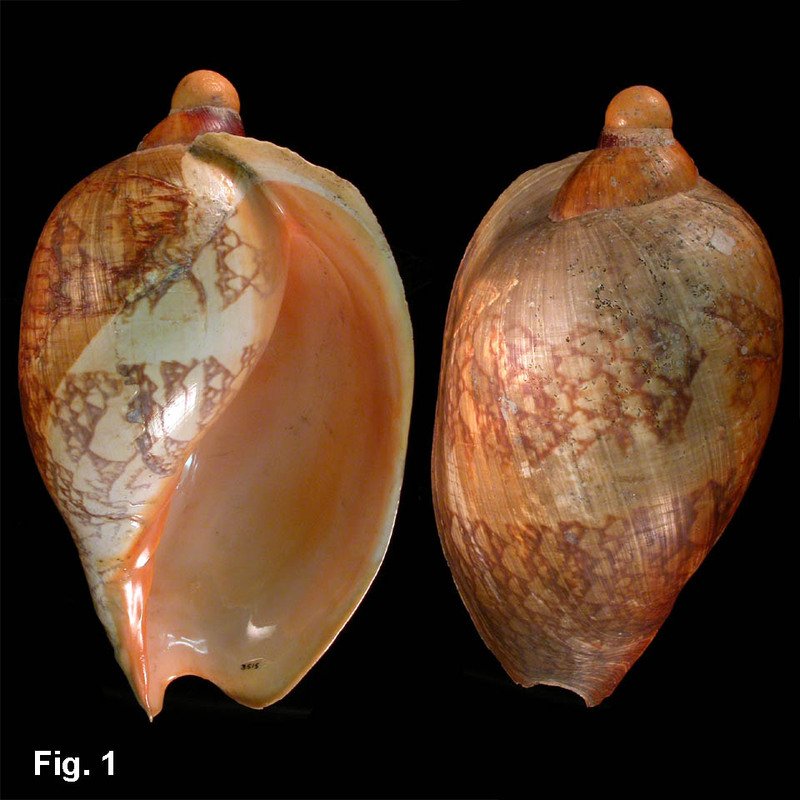 A similar specimen was figured by Tatlow & Beechey (2003).